But I once again outperformed the market in 2018 in my personal trading account, thanks to my Extended Elliott Wave Theory. 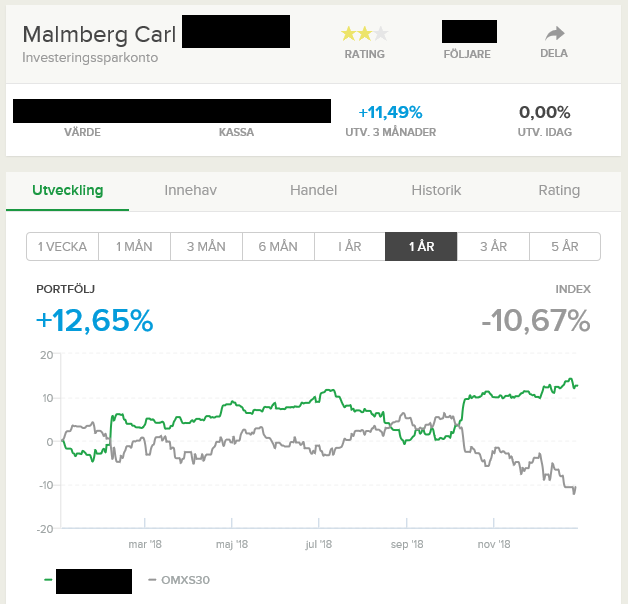 My trading account (in which I trade mostly Swedish stocks and index trades on the OMXS30 index), however, ended the year 2018 at +12.38%, which constitutes a very strong outperformance of almost 25% (!). This is following my outperformance of our market last year, 2017, where I ended up +11,03% versus approximately +3.3% for OMXS30. This year, I used the same discretionary active trading style as before, holding both negative and positive positions, mostly in stocks and stock index products, throughout the year. And as before, I hold positions on different time horizons. Elliott Wave Theory, or rather, my own extensions of it, that I call simply “Extended Elliott Wave Theory” is the cornerstone of my analysis process, and what you can get access to on this site through our analysis services. Let’s have a look at my equity curve for this year, screenshotted from the Swedish social trading site Shareville.se, which is connected to the online bank and brokerage NordNet which is where I have my trading account. Shareville.se only displays accounts trading real money. I’ve blocked out my account value and cash balance, as well as my username and number of followers, for various reasons of privacy. As is evident, I suffered a minor drawdown at the start of the year, as I took very large negative positions ahead of the end-of-January market crash. This turned out to be a correct call, and I then managed to keep my portfolio trending upwards until early July. But at that point, the Swedish stock market made a stronger upturn that I anticipated at the time. I purposefully entered negative hedges during the start of the upturn, and then suffered a drawdown which even made my portfolio dip into negative territory briefly, before a combination of 1) the market “regaining its senses” and turning down as it should, and 2) me having added even more to negative positions, produced a strong comeback which lasted into year-end. I mostly use mental stoplosses, and I failed to move them up and trigger them on three positions, which cost me an estimated +2-3% in extra yield. I failed to correctly analyze one of our Swedish market’s many erratic swings, while being heavily tilted in the other direction. However, this failure was of a lesser degree than the one mentioned above, as 1) I had expected a move counter to my negative tilt, albeit a much lesser one, and 2) I still stuck to my analysis and trading plan and kept shorting the market until it broke and I won. Now 2019 has started, and we’re all off to the races again to try and win over each other. For you, the wise thing to do to start the year off properly, is to subscribe to the analysis services on this very site. ← Turkey crisis predicted 2+ years ago.